I feel good this morning. After almost 6 weeks of chasing, I managed to speak with רב שכטר. He is in Tannersville during the summer and basically learns all day. I felt uplifted speaking to a גאון בתורה who is also so Menshlich and unassuming. We discussed a range of issues, not all of which I will publish here, of course. The מצווה of ובערת הרע מקרבך implies that there is no so-called time limit against alleged criminal activity. They must be investigated. There is no איסור of חילול השם involved in re-opening and investigating something which happened in the past. On the contrary, especially when the אומות העולם do this as a matter of procedure and process, by not doing so, that of itself is a חילול השם because it gives the impression that their moral system is superior to ours. There is no din of מסירה in cases of a possible public menace. The determination of what is a public menace is guided by the best possible advice from specialists in the field. Since specialists agree that recidivism is the unfortunate norm in some known categories of crime, even if the מלכות של חסד may mean that the punishment is greater than Torah Law and therefore problematic, we must submit the possible public menace to the authorities. וכל ישראל ישמעו ויראו ולא יזידון עוד. 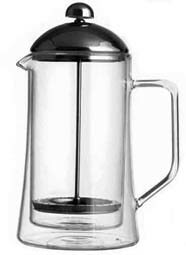 He did not know what a “french press” was, and whilst we discussed the views of the חזון איש in הלכות שבת we agreed that he would investigate this matter after someone showed him a french press and he properly understood how it works etc. On the matter of headlines on blog posts or newspaper posts which used the generic term “Charedim” and then processed to discuss a particular group within the Charedim inside the article, where that group/organisation/members have performed eg revisionism and a hiding of the truth, he said that it was a מצווה to be מוכיח those who distort the truth. He wasn’t sure whether writing “Charedim” in general in a headline and then expanding on the particular group in the body of article was an איסור. He said he would think about it further. He said that the Rav davened a Nusach which was a quasi Nusach Ari sprinkled with elements of Volozhiner Nusach. He hadn’t heard of a Minhag to only eat Milchigs on שבועות but mentioned there was a recent publication from קרלין סטולין entitled בית אהרון וישראל that was comprehensive in tracing the various שבועות מנהגים. If anyone has this, I’d be obliged.